The kitchen is probably the most complicated room to pack when preparing for relocation. With so many sharp and fragile items, liquids and perishables, one can easily make a mistake. Therefore, packing a kitchen requires more patience and skill than any other room. If you are moving to New Jersey with all your belongings, be careful how you pack because losing your stuff in transportation makes the whole thing pointless. 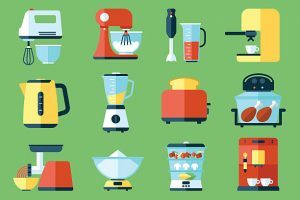 If you want all your dishes and appliances to remain in one piece, take our advice on how to pack your kitchen properly. Start early – do not postpone packing. The later we start the less thorough and careful we are because there isn’t enough time. Decide what stays and what goes. Separate the things you no longer need first and get rid of them. Get your packing supplies. 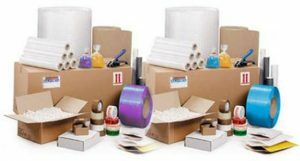 Boxes, padding, markers, tape, and paper are your basic supplies. Start the packing with the least used items. For example, start from the things you use rarely or only on special occasions. Pack the necessities last. Separate the things you will use the last day in your old home and the first day in your new home and pack them last. Put smaller items inside bigger ones. Wherever you find enough space, fill it with something. These objects travel better when there is not much room for them to move. Make sure the weight of the boxes is reasonable. If not you personally, someone else will have to carry those boxes. Label your boxes clearly. And be specific. Instead of writing “kitchen” write “kitchen – wine glasses”, for example. This way people know which boxes to be extra careful with, plus, it helps you unpack more easily. Hire professionals, if you are not sure how to pack your kitchen. Moving companies NJ usually provide packing as one of their additional services. Before we show you how to pack your kitchen, you need to know how to prepare for the packing. First of all, decide what has to go. Avoid being emotional and clinging to things that don’t work or those you never use. Donating, selling, recycling – there are many options. Firstly, you can help someone in need. Secondly, you can earn a few bucks. Thirdly, you can save time when the moving day comes. Finally, fewer items mean lower moving costs when hiring professional movers. Once you’ve decided what stays, decide how much packaging material you need to pack it. Luckily, you don’t need to buy everything. Do you still have the original boxes for your kitchen appliances? Do you have any boxes at home? How about cases and bags? In addition, you can get free boxes at various places, for example, your local grocery store. Some of them should be thicker and stronger, to support the weight. Also, boxes with dividers for glasses or bottles would come in handy. Apart from boxes, you’ll need padding, markers, tape, and paper. Many different things work as padding – bubble wrap, foam wrap, but also things everyone has in their home like old clothes, pillowcases, and towels. As for markers, it’s a great idea to have different colored markers for each room. When it comes to paper, old newspapers will do. Large kitchen appliances should be prepared and packed very carefully and safely. Improper handling could lead to serious consequences. Bear in mind that larger appliances such as freezers and refrigerators should be defrosted first. This could take some time, so do it in advance (at least 24 hours). Also, consult a professional, in case you have any doubts. Your moving company staff should be able to help you, as well. Put smaller pots and pans inside bigger ones to save space. When the smallest one is in, put some paper on top. Bubble wrap isn’t necessary, unless the lids are made of glass, because these items are less fragile. Also, feel free to use bigger boxes. Breakable dinnerware such as plates and glasses should go in stronger containers. Cover the bottom of the box with paper or bubble wrap, then wrap each item with the same material. Between every few items add some extra paper. Put more paper on top before closing the box. When it comes to plates, pack them upright, they will be safer. As for the glasses, make sure to wrap them and stuff the insides. Extremely fragile items can be wrapped in old tank tops or T-shirts – use your imagination. Note that handles are the thinnest and most fragile parts. Pack each type of silverware separately. Use a rubber band or string to hold the items together. Then, wrap each bundle in paper. Most importantly, pack the knives safely. Wrap them separately, using corks or something similar to protect the tips. Finally, place everything in one box and secure the lid with tape. Alternatively, smaller silverware can be put in larger boxes to fill up loose space. Downsizing your “to keep” pile is particularly important when it comes to food. The less food you transport, the better (think of saving space and/or money). Obviously, a half used bottle of chilly sauce may not be worth taking. Therefore, eat, donate, toss anything that’s expired. Bear in mind that perishables do not go on longer trips. When transporting food, especially liquid, use plastic bags and tape them closed to make sure nothing leaks. We hope you’ve found our advice useful. In case you still don’t have enough confidence or you only need help with the most sensitive items, leave it to the pros. Professional movers know how to pack your kitchen (and everything else) in the best way possible. 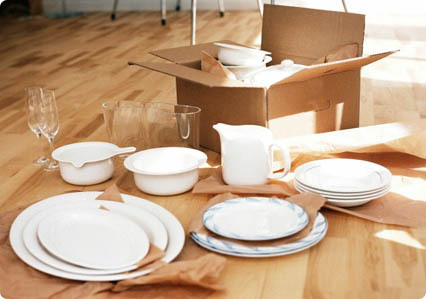 The longer the moving distance, the more likely your items are to be damaged, if not packed properly. When moving across the country, finding good long distance movers in New Jersey is the best option.